NEW! Fact: Strawberries contain 14% more Vitamin C than an orange. 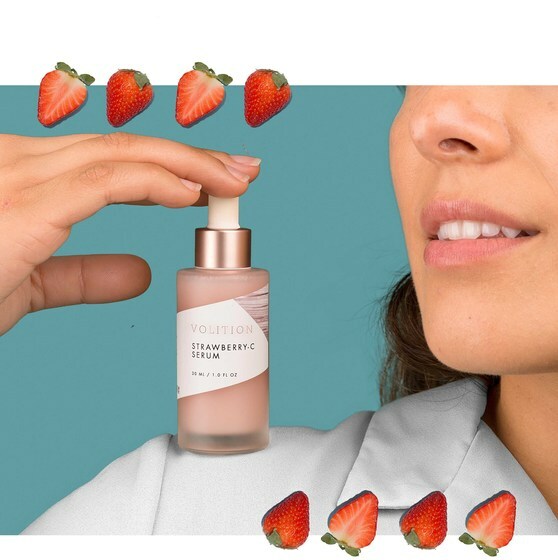 This ultimate brightening serum is packed with a high concentrate of strawberry-derived Vitamin C for noticeable radiance, hydration and even skin tone. You have been added to our waitlist. If you're satisfied, keep the full size. If not, return it unopened, free of charge. - After cleansing & toning, apply a pea-sized amount to face, neck and décolletage. - Gently massage into skin. - Once serum has absorbed, apply moisturizer. - Use twice daily; in the morning and at night. - For external purposes only. Avoid direct contact with eyes. 1. Fully remove dropper from the bottle and squeeze the dropper bulb. 2. Submerge the dropper in the bottle and release the dropper bulb. 3. The dropper will now be filled. Enjoy your Strawberry-C Serum! Approved for all skin types. Our clean beauty products are never formulated with sulfates, parabens, fragrance and other harmful/banned ingredients. Pop your serum in the fridge for a refreshing, cooling effect! "With so much customer involvement in the production process, it's no surprise the serum's a hit." This is by far one of the best serums I have ever used. It doesn't have any fragrance and it absorbs beautifully. And IT WORKS. My skin has never been my best feature - I suffered horrible acne as a teen and even as an adult I still get a pimple now and then. I am so fair that even the most minor pimple will scar. This serum has lightened my 16 years worth of scarring and evened my skintone so much that I will never stop using it. I love what it is doing for me and it makes me want to try more from Volition. 10/10 recommend. I love this serum. 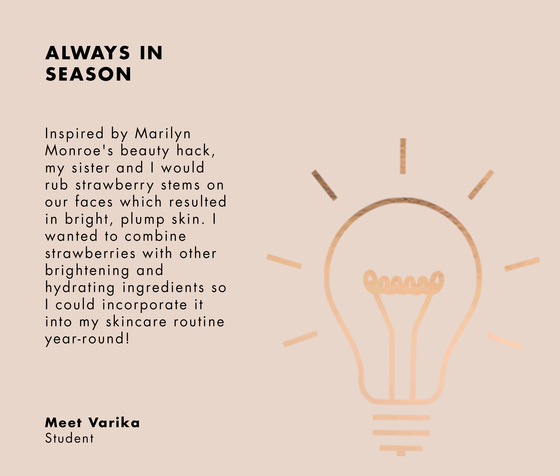 I have tried many and Volition's Strawberry serum is my favorite. I have noticed a change in the texture and tone if my skin. It evened out my tone and gives my face a radiant glow. It takes a few seconds to absorb but that is typical of facial serums. I love the uniqueness of the serum by using strawberry derivatives instead of oranges. Super fast shipping. Very happy with my purchase. I mostly have a sensitive, dry / dehydrated skin. I was kind of skeptical about this product at first since I know most Vit C oxidizes very quick and heats the face up. Upon trying it felt a little sticky but after a few seconds it goes away and leaves your skin very smooth. I did not notice any tingle or heating on my face and after 2 days my face brightened and looked flawless. Blends well with other products tried. The only con is the dropper which takes a few tries to get some product. I was searching for a vitamin C serum to add to my skincare routine and read a review for this one in a magazine. My skin is dry and can be irritated by some products. I have some overall blotchiness, and I’m prone to mild hormonal breakouts. My skin is also hyper-reactive to many detergents and skincare products. I currently use the Caudalie daily moisturizer. After using the Volition serum for just a week, my skin is noticeably less blotchy and red, and appears brighter and smoother. I don’t have any issues with the dropper - just follow directions for use. I use a pea sized amount and it sinks in very quickly, and follow up with a moisturizer. It also costs far less than some of the other Vitamin C serums out there. If I continue to get noticeable results, this serum will be my go-to. Highly recommend! I really love the way it feels on my skin. I have combo skin and it adds just enough hydration and doesn’t leave me oily. 1. How do you use this product? 2. How often are you supposed to use this product? 3. What're the different benefits between Strawberry-C and Snow Mushroom? 4. What ingredients in this product have Vitamin-C? 5. How much of this product am I supposed to use?